It does not seem possible that anyone will be capable of explaining the meaning of each of the one thousand names exhaustively. This is because each name is a universe in itself. The meaning of each of these names has the extent and the depth of the universe. When we read the meanings of the one thousand names we realize that there is nothing in the universe other than the omnipresent Maha Vishnu. The illustrious son of Kerala, Aadi Shankaraachaaryar went to the hermitage on the banks of the river Narmada and prostrating at the feet of Govindapaadaachaaryar, requested him to accept him as his disciple. The Guru saw divinity in the small boy even at the first glance and accepting him as a disciple, made him stay in the hermitage and taught him the profound principles of spirituality. 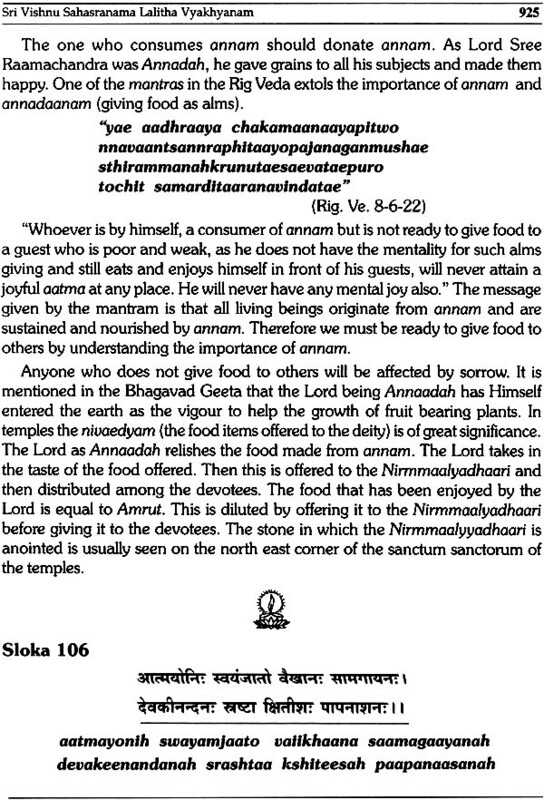 The Aachaarya Swamigal was able to grasp easily the principles of Vedanta that the Guru taught him. To gauge the depth of the disciple's knowledge, Govindaachaaryar instructed Sree Sankara to write a commentary for the Vishnusahasranaamam. Executing the work assigned to him admirably, Sree Sankara submitted the commentary at the feet of his Guru. 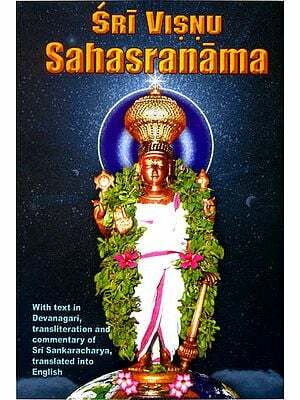 It is worth remembering that it was for the Vishnusahasranaamam that Sree Sankara first wrote a commentary. Sree Govindapaadar examined the commentary in full and being fully satisfied with it, praised the disciple without any restraint. Then Govindapaadar asked Sree Sankara to travel all over India and spread the principles of Vedanta. 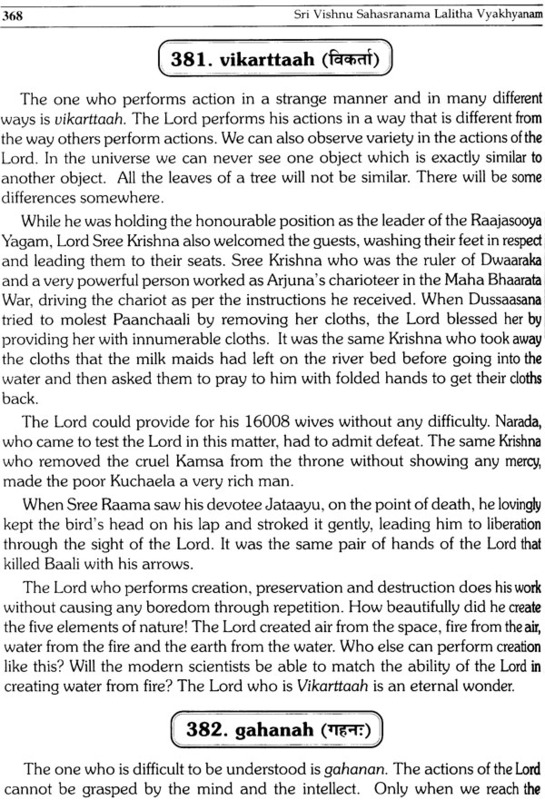 It was after receiving the blessings of Maha Vishnu and his Guru Govindapaadar through the commentary on Vishnusahasra-naamam that the master from Kalady became active in the spiritual field and became the Jagad Guru after attaining the Sarvajnapeeddam. 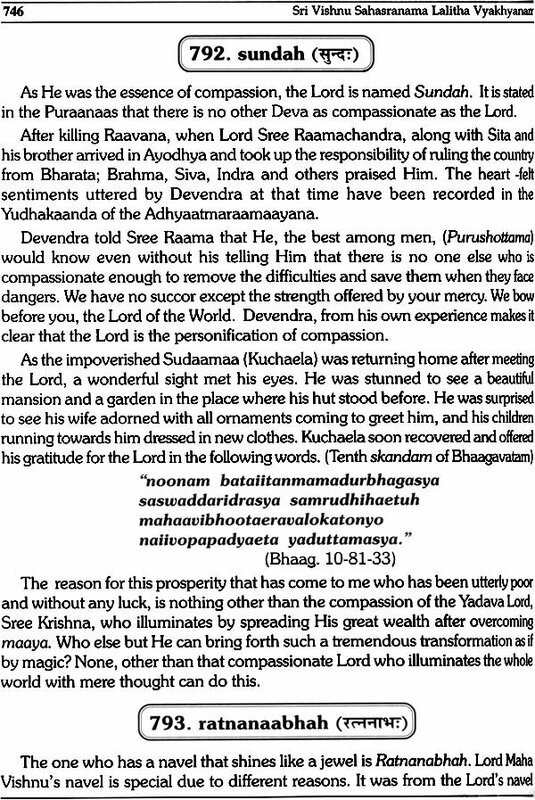 Swami Chinmayaanandaji who became revered all over the world through his 'Geetaajnaana Yajnaas' has recorded the following in the foreword to his commentary on Vishnusahasranaamam. "The 'Thousand Names of Vishnu' provides us with thousand clear arrow-marks rising from the known, indicating the unknown. Contemplation upon these can deepen our faith in, broaden our devotion to and steel our understanding of the All- Pervading Reality, Vishnu". 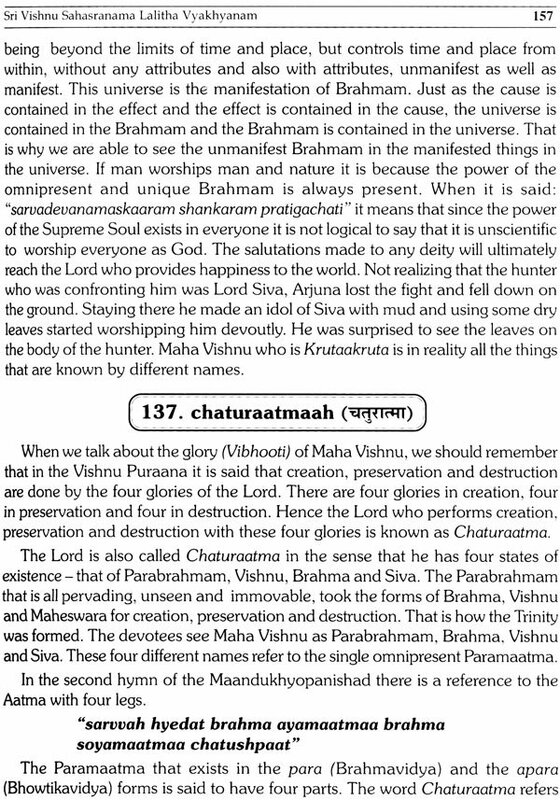 For the explanation of the names of Vishnu, I have mainly relied upon the commentaries of Sankaraachaaryaswaamikal and Swami Chinmayaanandaji. 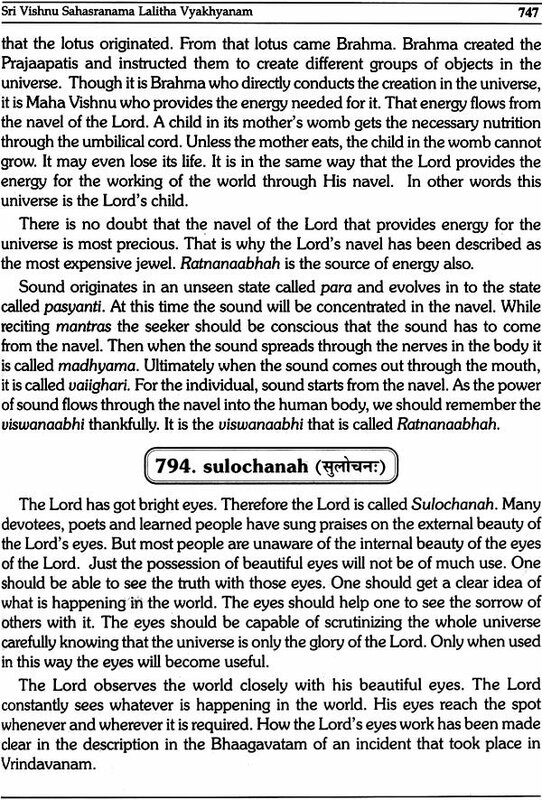 The Sankarabhaashyam in Sanskrit is very concise. Aachaarya Swaamikal restricted the explanation of most names to two or three lines. 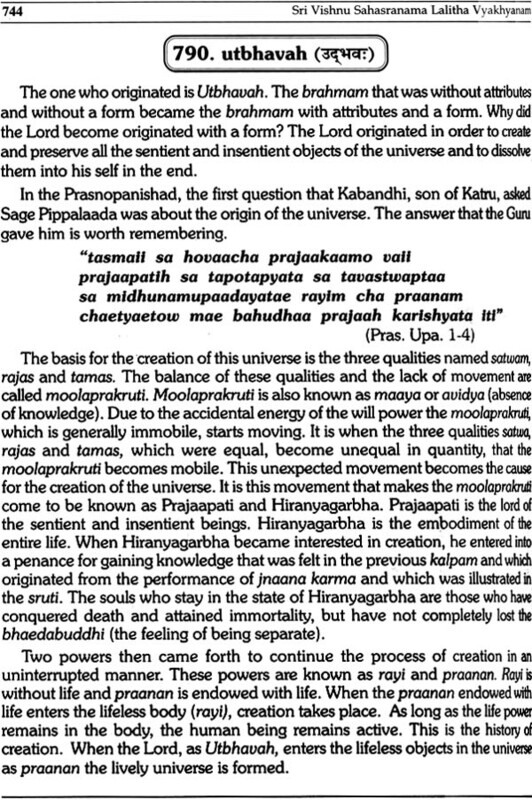 Aachaaryaswaamikal might have made it concise as he had to submit it before his Guru who was omniscient. There have been many commentaries on Sankarabhaashyam itself later on. 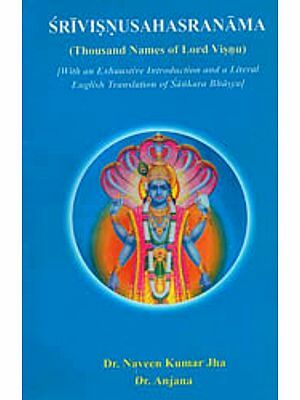 The commentary on Vishnusahasranaamam written by Swami Chinmayaanandaji in English became a blessing for those who have received the modern education. 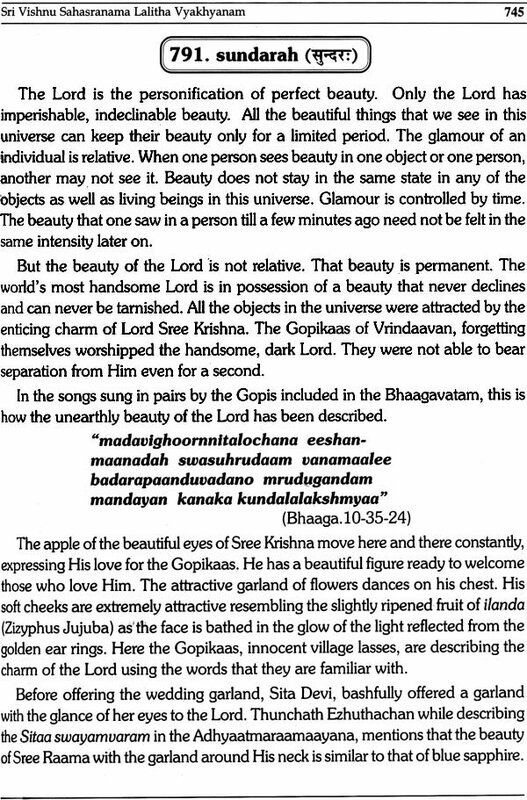 The foreigners could also know about Vishnusahasranaamam from it. Many other great men have also written commentaries on Vishnusahasranaamam. The most important among them are Aanandateerthan, Krishnaanand, Gangadharayogeendra Parashara Bhatt, Mahaadevavedaanti, Ramanandateerthar, Vidyaaranyateerthar, Sree Raamanujaachaaryar, Brahmaanandabhaarati, and Ranganaathaachaaryar. 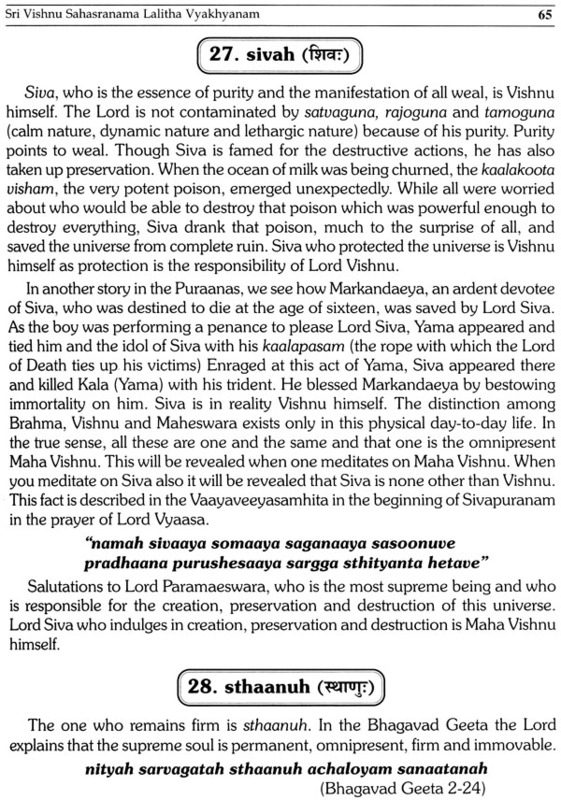 In Malayalam, Swami Nirmalaanandasaraswathy and a householder Aacharya K.A.Subrahmanya Iyer have written commentaries on Vishnusahasranaamam. I got the incentive to write the commentary quite unexpectedly. 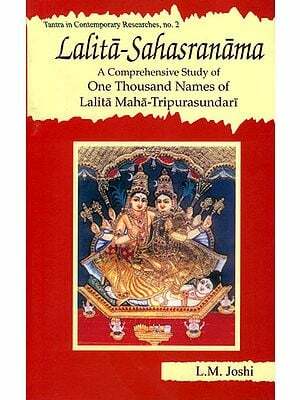 Many devotees have been persuading me to compose a commentary of the Vishnusahasranaamam which can be easily understood by the common people. Since making commentaries for the thousand names of the Lord was too ambitious an act, I did not attempt it. It was at this time that Smt. Vimala Rajakrishnan, the editor of 'Jyotisharatnam' contacted me on the phone from Kollam. She informed me that if I were to write a simple commentary on the Vishnusahasranaamam, she was interested in publishing it in her fortnightly, 'Jyotisharatnam'. She also suggested that I should include stories from the Puraanas to attract the common readers. 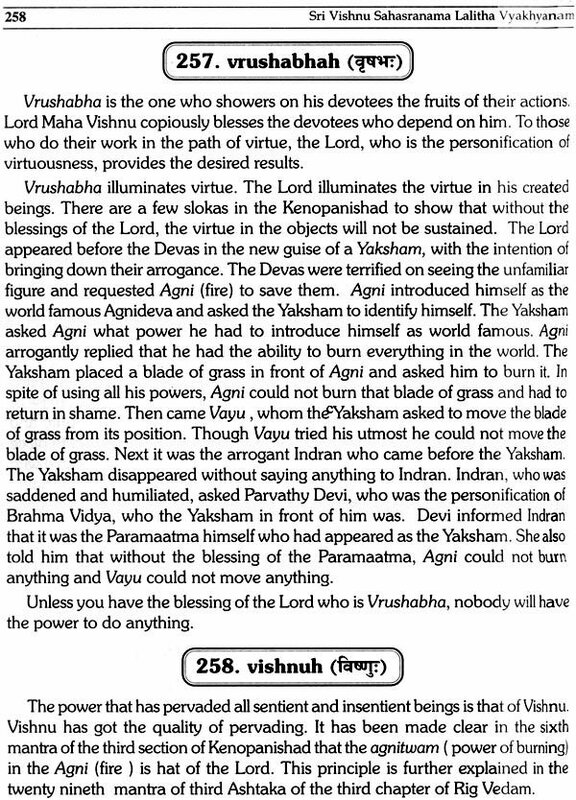 Seeing this as God's will, I started writing the commentary with a prayer in my mind to Maha Vishnu. 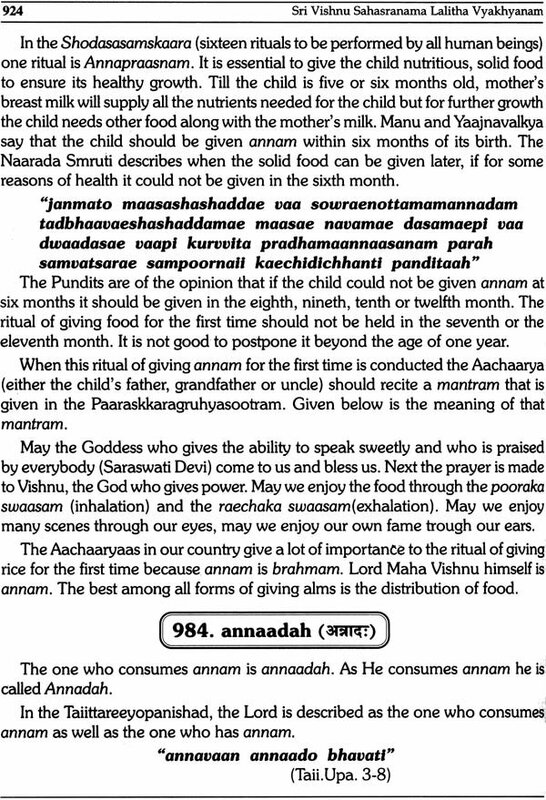 From the July 2005 issue my commentary on Vishnusahasranaamam was published in the magazine under the title,"Vishnusahasranaamathae Atuthariyaan" (Know the Vishnusahasranaamam closely). This is being serially published in the 'Jyothisharatnam'. The serial publication has been getting a tremendous support from the readers. Smt. Vimala Rajakrishnan, Editor of the fortnightly magazine 'Jyotisharatnam', is the wife of Dr.Rajakrishnan who is the Chief Editor of periodicals like 'Keralashabdam', 'Naanaa' and 'Kumkumam' and a well known figure in the Malayalam publication sector. 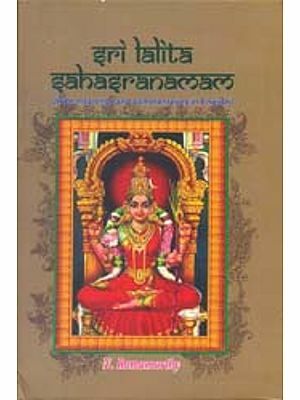 An ardent devotee of Vishnu, she has been engaged in the glorious mission of making the Vedaangajyotisham, history of various temples and other spiritual subjects, available to the common people. The incentive to publish this serialized commentary in a book form also came from her. I pray that Smt.Vimala Rajakrishnan, Dr.Rajakrishnan and their family be blessed by Lord Maha Vishnu. Though I started the work on the commentary in June 2005, the progress was very slow. As I was concentrating on the work on the commentary on the Bhagavad Geeta and the book 'Kshaetraaraadhana', I could complete the commentary on only 600 names by March 2009. That year the Vaishaakha month started on April 26th. I conducted Bhaagavata Sapthaaham at the Azhinjilam Thali Vishnu temple at Raamanaattukara, near Kozhikode from that day and after that from May 5th at the Tirumangalam Vishnu-narasimhakshetram near Panteeraankavu. I made a heart -felt prayer to Maha Vishnu at the time of the Sapthaham to bless me to complete the commentary on Vishnusahasranaamam. The Sapthaaham was over on May 12th. I recommenced the work on the commentary on May 14th. Surprisingly, with the blessings of the Lord I was able to complete the commentary on the 400 remaining names by June 25th. The Lord made me write the commentary on 400 names in 43 days while it had taken me four years to complete the first 600 names. The emotion that thronged my mind that Thursday when I kept the pen down after completing the commentary on the last name, "sarvapraharanaayudha" is indescribable. I firmly believe that the energy I gained from conducting the Bhagavata and Raamaayana Sapthaaham, in praise of Vishnu, enabled me to complete the commentary. 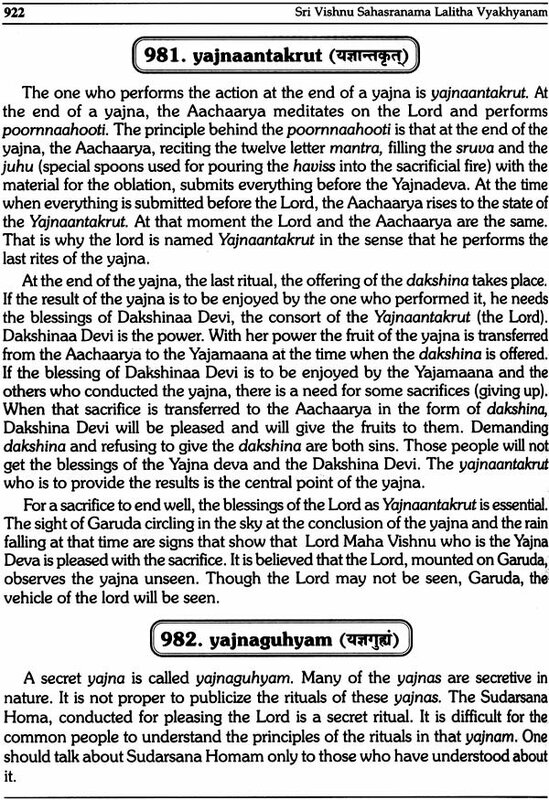 There are only 903 names in the Vishnusahasranaamam. The rest are repetitions. 69 names come twice, 11 names come thrice and 2 names come four times. The names that have been repeated four times are praanadah and sreemaan. It is this repetition of the names in the Sahasranaamam that troubled me the most. Where the names are repeated, I have tried to explain the name according to the situation, with reference to the names that come before and after it. But on some rare occasions I have been forced to give a commentary with similar ideas. Diagrams have been used to give a clearer picture of the meaning of some of the names. 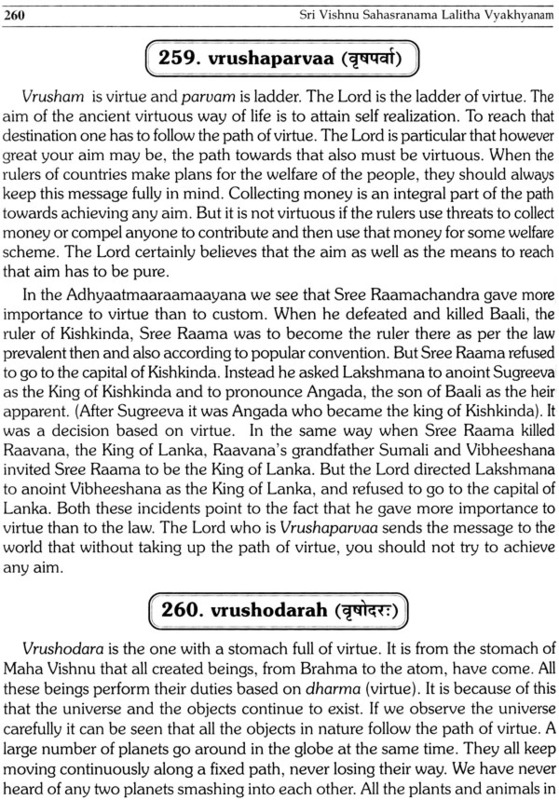 I wrote the commentary on the Vishnusahasranaamam keeping mainly, the common people in mind. Vishnusahasranaamam is recited by lakhs of devotees every day. But most of them mechanically finish reciting the names without understanding the meaning. Because of this the devotee who recites it does not get the full result. When it is recited with mistakes it will give the opposite result also. Rectifying that defect is also one of the factors behind this work. I have been able to keep myself in contact with the common people during the long years of my involvement in spiritual activities. 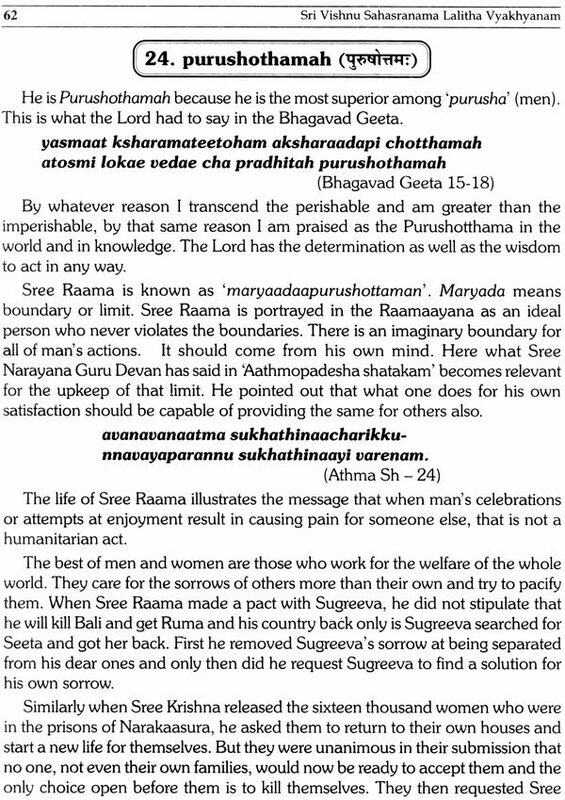 As I have been able to grasp the emotions of the devotees, I have tried to make the commentary on the Sahasranaamam very simple. 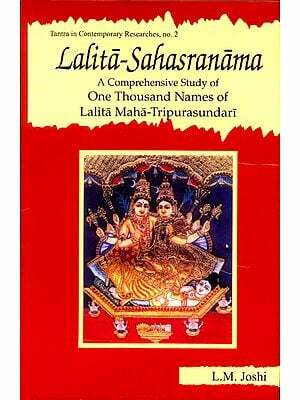 With the Lord's grace, I have accomplished this arduous task of making available the values of Sanaatana Dharma, and indicating the greatness of Lord Vishnu in our mother tongue, for the common man who may not have the knowledge of the Sanskrit language. While giving the commentary I have quoted and explained suitable portions from Rig Vedam, Adharva Vedam, Adhyaatma Raamaayanam, Bhaagavatam, Mahaabhaaratam, Upanishads and the Bhagavad Geeta. 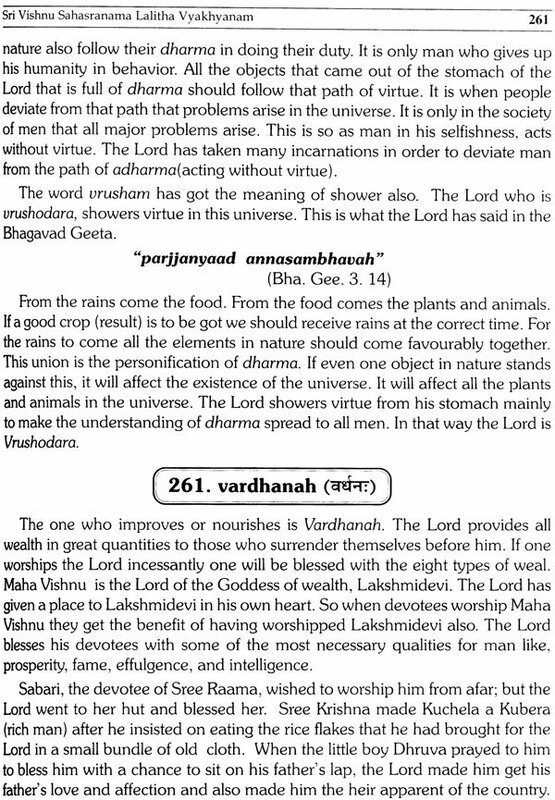 I believe that once a devotee has finished reading this commentary, he will have a clear idea of the Indian philosophy. 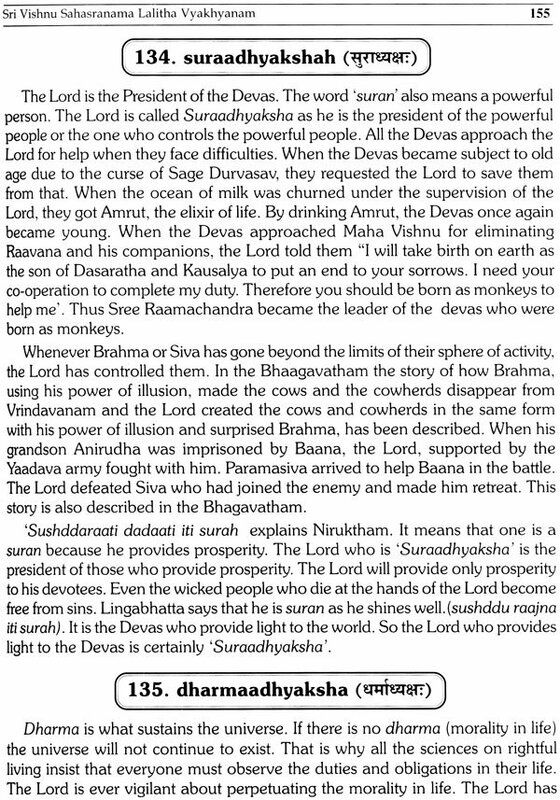 My father used to read the Devi Maahaatmyam and the Vishnusahasranaamam after the evening prayers. So I was able to learn the Vishnusahasranaamam by heart very early in my life. 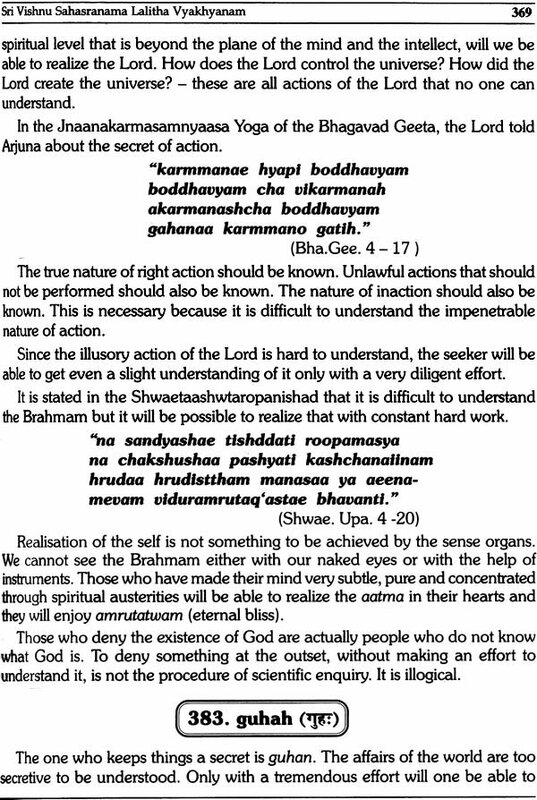 It became a habit to recite the Vishnusahasranaamam mentally whenever possible. While waiting in the queue at the Guruvaayoor temple for darshan I never felt the passage of time as I used to recite the Vishnusahasranaamam many times. Reciting the Vishnusahasranaamam helps in cleaning the impurities of the mind, and thereby provides peace of mind. Everyone - students, manual labourers, home makers, politicians, statesmen, those who work in the police department or in the military department, those who do artistic work, teachers - gets an added mental energy when they praise the Lord through the Vishnusahasranaamam. They get the confidence to face and overcome any crisis. Once they have understood the meaning of these names, seekers have the desire to recite them every day. An idea of the ancient established customs of our land will be available to every man and woman who reads this book. I extend my heartfelt gratitude to my wife who helped me in preparing this book, to my children who supported me, and to my son-in-law and my daughter-in-law as well as to all my friends and relatives and the devotees. Mr. Somasundaram who retired as a teacher from the Palakkad Valiyangaadi Vocational Higher Secondary School, helped me sincerely by reading through the proof and correcting the spelling mistakes. I extend my gratitude for his sense of dedication and the greatness of mind, and pray that the Lord grant him the health to work in the spiritual arena for a long time. I salute my parents and my teachers. I submit this holy work for the people, bowing before chanddayogaeshwari, the deity of the Mandampurath Bhagavathy Temple at Neelaeshwaram, Sree Dharma Shastha of the Kollangod temple at Chevaayur in Kozhikode and Sree Guruvayoorappan.